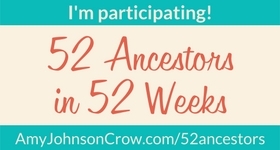 This is not really a story about an ancestor, just a bit of family history. My father was an Army officer for about 20 years, and one of his “overseas” assignments was a 3 ½ year stay in Guatemala. This was in the 1970s and I was entering my teen years at the time. One thing you can say about native Guatemalans is that they have colorful apparel! My mother bought a ton of Guatemalan fabric and sewed some of our clothes from it. Since I don’t do much work with textiles, I recently gave a friend who does a large stack of beautiful, patterned, hand-woven cloth, some with metallic thread undulating through it. I regret I didn’t photograph the pieces first. Each native village has its own particular style, weave, color palette, dye pattern, etc. Women’s tops are called huipiles (pronounced wee-peal-ays). Here are two that I still have in my possession. I believe both of these are from Santa Maria de Jesús. Certainly the top one is. I borrowed this chartreuse dress from my mother for a formal dance, and the gold sandals! It’s a little difficult to see, but check out the colorful, rainbow-hued jumpsuit my little brother is wearing – that’s a Mom original. Hey, it was the 70s. Jumpsuits were the rage. Taken in our colorful front yard in Guatemala City. That’s our shepherd, Taurus Bulba. Loved that dog! Another Mom original (Me!) – well, really, the cobalt housecoat. My brothers and I were not happy to be dragged out of bed early in the morning so Dad could take our picture before he left us for several months. That’s my grandma, Reatha Halse, equally thrilled, in the background. Oh yes, and what later became my first car, a 1974 Vega. Another one of my holdovers from those crazy days. Quetzal birds are a Guatemalan icon on this forest-green shirt. Singing was always a big deal, especially church cantatas and Christmas holidays. Here’s a group of women from church singing Christmas music in their scarlet Guatemalan dresses. Mom is on the guitar. Of course, Guatemalans wear it well. Threshing time. Feature image: Guatemalan market, possibly Chichicastenango, taken by Dad. Those are fabulous outfits! Your mother must have been a talented seamstress. I particularly love the housecoat and dress. Thanks! Mom did make me some nice outfits over the years. I especially loved an oriental style dress made from powder blue upholstery fabric. It is amazing to see how fashionable the Guatemalan pieces looked in the 70s! Such colorful clothes. Of course the 1970s in the US had some bright colors going on, but your Guatemalan style seems much more authentic than the hippy garb I saw around. I like the chartreuse dress, nice touch with the gold sandals. You got that right, Ally! I thought about adding a pic or two with my 70s “hippie” colors, but then stuck to the theme of Guatemalan textiles. Thanks! I enjoy digging through the memory trove on occasion. I love Central/South American Textiles! When I lived in San Diego, I wore all kinds of “hippie” attire (as Dad called it) I collected travelling through Southern Mexico and the Yucatan. You may see me in it again soon, as we’re working on a retirement plan in Panama! 🙂 Your blue housecoat is particularly striking! Your Mom was very talented! Hey Marto! Good to see you here. Planning to ex-pat to Panama? Sounds hot! I almost included a Panama shot on this piece, but decided some might find it offensive, so I deleted it. Don’t need the PC police after me! I had some other great pieces of clothing from my Guate days, but some were too small to wear and the moths got to the wool ones. I love the Cobalt housecoat. I would totally wear it. These are great! What a lovely part of your family history. Fun to see family history and culture in action. I tried some creative sewing myself. you and your brother reminded me of my kids. I was glad I had the opportunity to live in Central America. Such beautiful rich colors and patterns! They remind me a lot of the bright colors and patterns the Ndebele people of South Africa use on their homes and in their dress. The perfect post for the Colorful theme.